In the neighborhood of Chacarita, Buenos Aires, Azaí is a loft-type space especially designed for cooking and having a good time. We have a professional, state of the art kitchen in which twelve people can comfortably cook simultaneously. You only need to bring a willingness to learn and have fun, we will provide all the rest, from cookware to aprons. 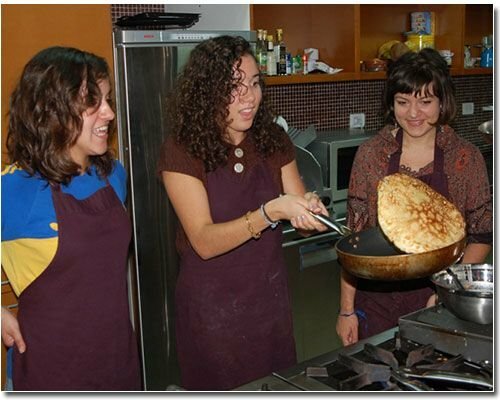 So as to ensure that the cooking process is experienced to the fullest, classes are interactive and the idea is for attendants to participate, but you can choose not to if you would rather relax and observe. At the end of each class we share the table to have a degustation of the dishes previously cooked accompanied by a glass of Argentine wine. Azaí is located in Virrey Loreto 3795, right on the intersection with Charlone Street, in the neighborhood of Chacarita. It is two blocks (two hundred metres) away from the six corners formed by the Avenues Elcano, Alvarez Thomas, and Forest. In the area where Azai stands there are many uneven streets and cul de sacs. This being the case, getting there might seem complicated. This is why we are giving you alternative ways of reaching Azai from different departing points throughout the city. Take Jose Hernandez Street until it turns into De los Incas Avenue (you will pass under a small bridge). In De los Incas Avenue stay on the right hand side of the Boulevard. After you reach the intersection of De los Incas Avenue and Forest Avenue go straight for an extra block (100 metres) and turn left on 14 de Julio Street. Follow 14 de Julio for five blocks (500 metres). As you do this, you will come across Alvarez Thomas Avenue and a square called 25 de Agosto. When you get to Charlone Street turn right, go straight for two blocks (you will come across Elcano Avenue) and you will reach Virrey Loreto Street. Take Del Libertador Avenue and turn left on Juan B Justo Avenue. Go past Santa Fe Avenue until you reach Honduras Street. Turn right on Honduras Street and follow it for two blocks (200 meters) until you reach Fitz Roy Street. Turn left and follow Fitz Roy until Cordoba Avenue. Turn right on Cordoba Avenue and go straight, even when the Avenue narrows down. After you pass the intersection of Cordoba Avenue and Federico Lacroze Street, the Avenue changes names and it is called Giribone. Follow Giribone and after the intersection with Elcano Avenue (there is a COTO supermarket on that corner) the first street is called 14 de Julio. Turn left on 14 de Julio for one block (100 meters) and then turn left on Charlone. Go straight for two blocks (two hundred meters) and you will reach Virrey Loreto Street (you will go past Elcano Avenue once again). Walking Azaí is seven blocks from Estación Federico Lacroze, subway B. When you get off from Estación Federico Lacroze you can catch a bus (65 or 44) going to Barrancas de Belgrano and jump at Av. Alvarez Thomas and Virrey Loreto street, two blocks from Azaí. Walking is fifteen blocks from Estación José Hernandez, subway D.
When you get off from Estación José Hernandez you can catch a bus (65 or 44) going to Chacarita, on the corner of Av. Cabildo and José Hernandez street; jumping at Av. Forest y Charlone street, one block from Azaí. Bus Stop at Av. Alvarez Thomas between Virrey Loreto and Virrey Arredondo street.